This Mid Rim planet is the principal world of the Kashyyyk system, a star system that also contains the homeworld of the reptilian Trandoshans. The close proximity of these worlds and a deep-rooted cultural animosity has fueled many altercations between the two physically powerful species throughout their history. Kashyyyk is a lush jungle planet where treetops serve as homes for the native Wookiees, a towering fur-covered species known to be ferocious warriors. There are four main continents on the planet, separated by bands of ocean that was studded with archipelagoes. 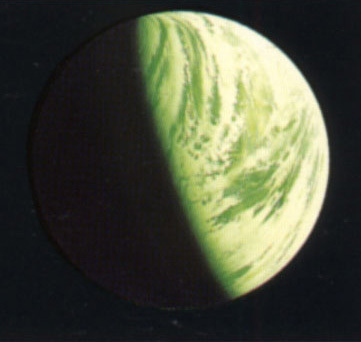 Despite its completely-forested appearance from space, about forty percent of Kashyyyk's surface was covered with water. Kashyyyk hosts a unique ecosystem of layered biodiversity. The planet has several horizontal levels of ecology throughout the forests, with each lower level increasing in hostile danger. The world's intelligent Wookiees occupy the uppermost level, the forest canopy. Inland, some of the lower levels have not seen sunlight in millennia, and are filled with deadly, primitive lifeforms. Wookiee culture has divided the forests into seven vertical levels. The mighty wroshyr trees are the most visible form of life on Kashyyyk. Kilometers-tall, the trees have the notable ability of fusing together if their growth paths intersect, forming a stronger, conjoined tree. The limbs in the forest canopy are so thickly intertwined that they form a natural cradle for Wookiee architecture. Entire cities are perched in the wroshyr branches, housing millions of Wookiees. Kashyyyk tree cities include the coastal city of Kachirho (in the Wawaatt Archipelago), Rwookrrorro, Kepitenochan, Thikkiiana, Okikuti, and Chenachochan. Though the Wookiees are the dominant lifeform on the planet, they share their world with countless lesser specimens. The foggy skies of Kashyyyk are pierced by the high-pitched cries and colorful swirls of plumage of the avian kroyies. Prowling the mighty boles are such predators as the horned katarn, and the five-limbed kkekkrrg rro. Lurking in the shadows are such creepy terrors as the arachnid webweaver and netcaster, the incendiary flame beetle, and the loathsome gorryl slug. Of course, there are some helpful animals too -- a wiry breed of bantha and the multi-legged sureggi can provide sure-footed transportation in the treacherous undergrowth. During the time of the Republic, the Wookiees were welcomed into the galactic community through dealings with Corellians and Alderaanians. Eventually, Kashyyyk was even represented in the Galactic Senate, with Senator Yarua being the last Kashyyyk representative prior to the outbreak of the Clone Wars. The planet serves as a navigation gateway for the entire southwest quadrant of the galaxy, making it of prime strategic importance. During the Clone Wars, the Separatists attempted to subjugate Kashyyyk by invading it with their droid armies. In response, the Republic dispatched a task force led by Master Yoda to defend Kashyyyk. With his war council that included the Wookiee warriors Chewbacca and Tarfful, Yoda's forces were able to repulse the mechanical intruders. The victory was short-lived. With the rise of the Empire, the Jedi were branded enemies of the Republic. The Imperial troopers took control of Kashyyyk, putting the planet under martial law. Yoda barely escaped, fleeing the green world aboard a secret escape pod. With the rise of the Empire came a terribly dark time for the Wookiees. At the advice of unscrupulous Trandoshans, the Empire blockaded Kashyyyk and enslaved the Wookiees, using their brute strength for labor. So devoted were the Wookiees to their homeworld, that many would brave the blockade to revisit their cherished forests for key Wookiee holidays. After the Battle of Endor, the Wookiees were finally afforded their freedoms. Casting off Imperial and Trandoshan shackles, the mighty forest-dwellers were again visited by the pall of slavery when would-be Nagai conquerors attempted to continue the vile trade. The Nagai were eventually repulsed. Under the guidance of Kerrithrarr, a Wookiee official, Kashyyyk entered the New Republic, becoming a key signatory and member world of the Republic's Inner Council. The planet welcomed trade and its city of Thikkiiana became a major exporter of computer technology.